The official award ceremony of the World Investment Award "Investment Angel" took place on Nov. 30 in Moscow, at the Ritz Carlton Hotel. Organizer of the Award - World Organization for Development – based on a few rankings: Agency for Strategic Initiatives (ASI) national rating, WOD own rating, conducted by the WOD-Research Agency, and official statistics from other international agencies, - announced the results on the most attractive investment regions of the Russian Federation as well as the most active foreign investors. The awards were presented by the Chairman of the Award Organizing Committee, the president of the World Organization for Development - Robert Abdullin. Nomination: Technology Investor of the Year. Nomination: Socially-oriented Investor of the year. World Bank publishes annually its own international ranking- Doing Business, which assess the state of business climate in a country, based on 10 indicators of one or two largest metropolitan cities. The latest results of the World Banks’ Doing Business were published, where Russia managed to climb up 11 places, moving from 62 to 51 spot. Order "For promotion of international cooperation in education" was presented to Tamirlan Hassan - President of the International University center in Europe. Cheremin S.E., Minister of Moscow Government, Head of the Department of Foreign Economic Relations of Moscow: "We receive the prestigious award of an expert community in attracting investment field, specifically foreign investments, which is an extremely high assessment of all my colleagues work in the Moscow Government. Over the past four years, we managed to increase the level of foreign direct investment in various areas of the city's economy by more than 4 times. " 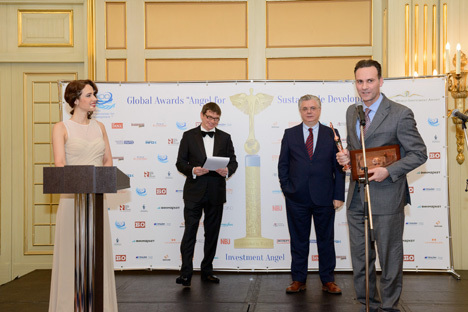 Pevnev S.V., director of marketing for Samsung Electronics Rus Company: "We express our gratitude to the Award organizers for recognizing Samsung as a socially-oriented investor. In a future, inspired by this wonderful award, we will strengthen our activities in this direction. We will strive to provide strong support to Russian economy and to make sure to stay worthy of such high honors. "